Over on Instagram this month, @onesewsweet and @naturaldane are hosting the #BHMPatternDesigners challenge. For the month of February -- Black History Month -- they encourage everyone to sew something designed by a Black Pattern Designer. They're also sharing lots of cool info on many different designers and on Black fashion history, so be sure to follow them for tonnes of great reading! I've been reading some books in preparation as you might have noticed by my two most recent Weekend Reviews. I've also been thinking about various patterns I might use this month, and have gone through my stash to see what I have on hand. I have a Tracy Reese "Plenty" McCalls pattern, M7251 which has two quite distinct top designs -- I love them both and would definitely wear both these styles. I'm strongly leaning toward this one. But I also have a handful of Khaliah Ali patterns, and there are a number of tops in there that I've been meaning to make for quite a while now. I might make View A (the short-sleeved white one) of S2230 or the flowy top from S2344. Then there are a few skirt and jacket options in there that also look good! I've just finished Chinelo Bally's Freehand Fashion, and am eyeing her Batwing or Hi-Lo top, as an easy way to start trying out her freehand technique. What about you? Were you aware of this challenge? Are you planning on making anything for it? Do you have any other designers to recommend? I hadn't heard about this challenge yet, thanks for sharing your ideas! I also haven't heard about this challenge, but as 'Freehand Fashion' is coming my way very soon I think it will be an ideal opportunity to make something for the challenge. Ooh, good plan! 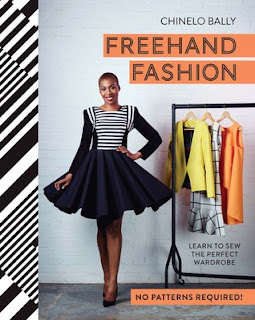 I'm glad you were able to find a copy of Freehand Fashion to check out. Well I have a couple of Mimi G patterns, so who knows? Mimi G! I'd have some of her patterns if Simplicity were still sold in Canada. That always burns me when I see cool new patterns I can't get easily. I have been thinking about the challenge. It motivated me to go through my pattern stash and pull out my Butterick Willi Smith patterns and Vogue Byron Lars patterns. I hadn't thought of Chinelo. She was one of my favorite participants on BSB. I was amazed at her ability to design and sew a garment without using a pattern. She was one of my favourite GBSB participants too. Are you watching the new series?? You are so lucky to have some Willi Smith patterns! They are so fun. I've never come across any -- yet -- in my thrifting travels.